On the first Monday of October, the people in our valley meet at a tiny community building in the woods to host a dinner for the fifteen or twenty folks who re-enact the journey taken by the Overmountain Men of 1780. These Appalachian pioneers had sacrificed so much to relocate and were at that time threatened just like their families had been in the Old World (some by the same people). Many had selected geography that reminded them of Scotland’s rough terrain where they fled famine and persecution. This time they would not be uprooted. And they were determined to take the fight to the enemy. This included the Blankenship family on Wade Nanney’s mother’s side. Like Captain John Nanney from Wales, the Ralph Blankinsopp family migrated to Virginia, about the same time. “The name was originally Blenkin’s Hop (hope, a small valley) from the Norththumberland area in northeast England but the people were Celtic, belonging with the Lowland Scots, not the Anglo-Saxons. Their original language would have been Gaelic,” according to Wade. Ralph landed in James City, Virginia, on July 23, 1640. He gave up his “head right” (50 acres of land in Virginia granted by the king to settlers) to pay for his passage to the New World. Ralph moved up the James River closer to Richmond and started his family. His son Ralph, Jr, was illiterate as there were no organized schools. He signed his name only with a mark. “Some clerk of court chose to record the name with ‘ship’ on the end instead of ‘sopp’ and the spelling stuck. At some point, in much the same way, the ‘i’ became ‘e’. Ralph Blankinship died at age 54 leaving several children, and his widow remarried. In 1764 two Blankenship brothers, Isham and Elisha, moved south to Bedford/Franklin County of Virginia. In 1779, they “pulled up stakes” again and moved to Rutherford County in North Carolina where they bought land on Big Cane Creek. And the following year, in October, the Overmountain men came through. Ferguson’s message delivered to Isaac Shelby on the Holston River told the pioneers to lay down their arms, and pledge loyalty to the King or he would march his army over the mountain and destroy their homes and crops and hang their leaders. Fighting words. The settlers decided it would be better to confront the enemy together rather than let the Tories attack their homes separately. I don’t understand how these folks organized so quickly. In three weeks without phones, Shelby got together 240 men, John Sevier had another 200, and William Campbell from Virginia brought more. Every seventh man was chosen to stay and protect the homes. 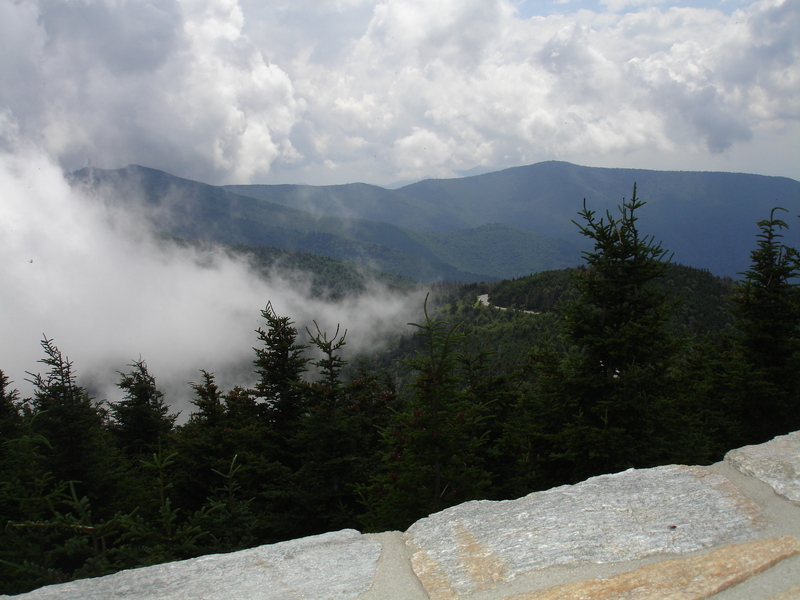 The others rode to Roan Mountain supplying their own horses, weapons, and food. They split up at Yellow Gap and came down the mountain in two routes just in case Ferguson was coming up. No Crown troops were seen, and the Overmountain men met at Quaker Meadows in Morganton, NC, homeplace of the McDowell brothers, and where their forces grew to 1400. And they were fed well. Fortunately a militia colonel from South Carolina rode into camp and told the backcountry Patriots that Ferguson had headed to Charlotte Town for reinforcements. Colonel Lacey convinced the troops to follow him 29 miles south to Cowpens to join his militia. Cowpens was owned by a Loyalist who gathered the cattle in the area and shipped them from there to Philadelphia. The narrator at our community club continued. “Though there wasn’t a thief among us, we helped ourselves to that man’s beef. We didn’t think he’d mind too much, since everyone of us was hungry. And armed. That’s the first solid meal we’d had in days. We unrolled our blankets. They was still soaking wet because it hadn’t quit rainin’ on us.” Many were sick with fever, and most of the horses were rode “plum to the ground.” The commanders made a decision and picked out 900 of the best men and 900 of the healthiest horses. And kept riding. “Cause if we didn’t catch him, none of us would be comin’ back crosst the mountain to our family. We just rode to our death.” (They had to stop Ferguson before his army increased.) 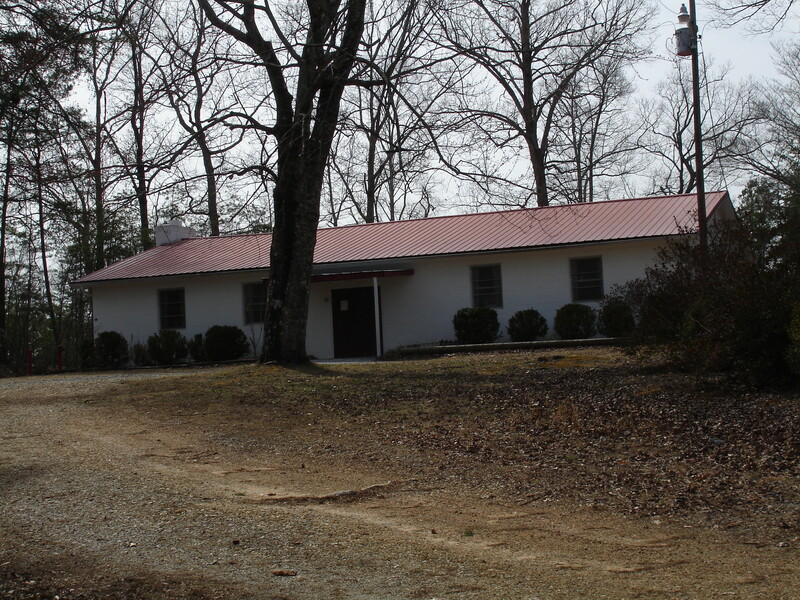 The next day, they apprehended a spy who told the Overmountain Men that Ferguson was at Kings Mountain. They could smell a battle and rode on until they reached the foot of the hill by afternoon. Every British soldier with Ferguson was killed or captured. Twenty-eight Patriots died. According to Sharyn McCrumb who wrote about this battle on the border of North and South Carolina, Thomas Jefferson hailed this “the turning point of the American Revolution.” Read McCrumb’s King’s Mountain. The above painting is so interesting. In the first place Lord Cornwallis is not present at the surrender. Too embarrassed, no doubt. So General George stays in the background, too, on a brown horse. On the left are our French allies under Comte Rochambeau, no brown for him. 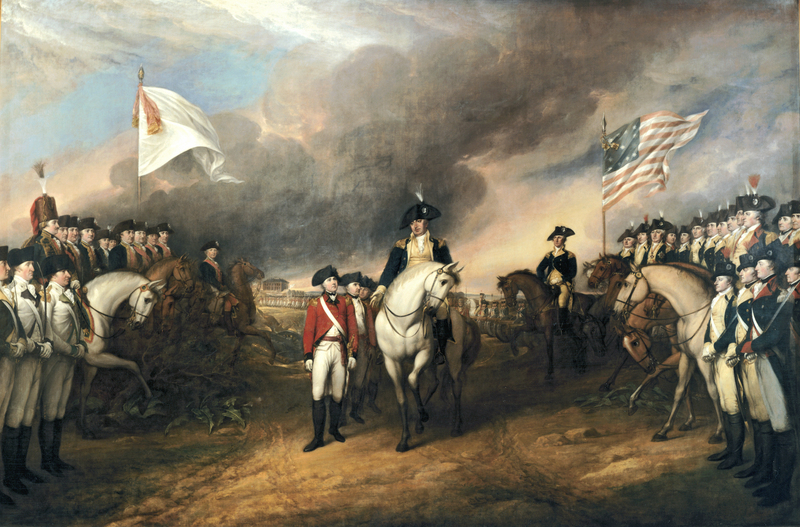 The white horse in the center is ridden by General Benjamin Lincoln and he has his hand out to take the sword of General Charles O’Hara, second in command for the Crown. The artist, JohnTrumbell, justifiably has Lafayette in the Patriot crowd. And he also has his own brother in there, because he served in the Continental Army. (May I mention that Edward Upton, one of the Brackett Township originals was also at the Yorktown surrender as a member of the Continental Army–See this blog Chapter 1: Brackett Town Saga) The British troops are seen in the background, receding and hazy, just like their power over this new continent. I feel a kinship with this painter. He obviously did his research, but check out the horses. Doesn’t the stallion under Lincoln look like he’s saying “Hey, baby” to the other white horse on the right? He’s happy the war is over. Note: Wikipedia records that Lafayette is buried in Paris under Bunker Hill soil. Very cool. This entry was posted in Characters, Dialogue, Nanney Saga, Setting and tagged Continental Army, Loyalist, Major Patrick Ferguson, Overmountain Men. Bookmark the permalink.